The Hong Kong Stock Exchange (HKEx) published new Guidance Letter HKEx-GL89-16 (archive) (the Guidance Letter) in November 2016 providing guidance on issues related to "controlling shareholders" and relevant obligations under the Listing Rules. The guidance focuses on clarifying how the HKEx interprets the Listing Rules' definition of "controlling shareholder" and its practices in relation to: the listing requirement for ownership continuity and control under Main Board Rule 8.05(1)1 and GEM Rule 11.12A(2); the post-listing lock-up on controlling shareholders under Main Board Rule 10.07(1) and GEM Rule 13.16A; and the pre- and post-listing disclosure obligations relating to controlling shareholders. in a position to control the composition of a majority of the board of directors of the issuer. As regards depositary receipt issues, "person" in the definition of "controlling shareholder" includes a holder of depositary receipts. The depositary will not however be a controlling shareholder merely because of its position as depositary holding the issuer's shares for the depositary receipt holders. The Guidance Letter notes that the process of identifying the "controlling shareholder(s)" of a listing applicant is conducted on a case-by-case basis and depends on the facts and circumstances of each case. The HKEx requires sponsors to conduct appropriate due diligence to ascertain that the information related to the listing applicant's "controlling shareholder(s)" which is set out in the listing document is true, accurate and complete in all material respects, and not misleading or deceptive in any material respect. The HKEx also has the power to deem any shareholder to be a controlling shareholder or a group of controlling shareholders of a listing applicant or issuer based on relevant facts and circumstances. The Guidance Letter gives four examples of common ownership structures to illustrate their interpretation of "controlling shareholder". The examples are non-exhaustive and assume that none of the holders of voting interests in the listing applicants have identified themselves as groups of controlling shareholders. In Example 1, Mr. A and Mr. B are considered to be controlling shareholders of the listing applicant as each of them can exercise 30% or more of the voting power at general meetings of the listing applicant. Conversely, Mr. C is not a controlling shareholder as he cannot exercise, or control the exercise of, 30% of the voting power at general meetings. In Example 2, each of Mr. A, Mr. B and their wholly-owned SPVs (SPV A and SPV B) are considered to be controlling shareholders of the listing applicant as: (i) each of SPV A and SPV B can exercise 30% or more of the voting power at general meetings of the listing applicant; and (ii) Mr. A and Mr. B are able to control the exercise of 30% or more of the voting power in the listing applicant's general meetings through SPV A and SPV B. Mr. C and SPV C, on the other hand, are not controlling shareholders as SPV C has only a 19% interest in the listing applicant which is below the threshold under the controlling shareholder definition. 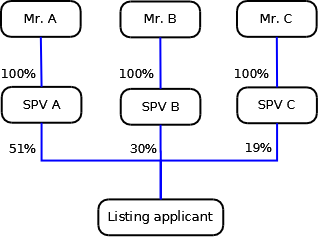 In this example, SPV A, SPV B and SPV C are the investment vehicles of the three individuals and their exclusive purpose is to hold the individuals' interests in the listing applicant. They have no other operations. The Guidance Letter states that if the investment vehicles did not exclusively hold the individuals' interests in the listing applicant and/or had other operation(s), the HKEx would assess them on a case-by-case basis. 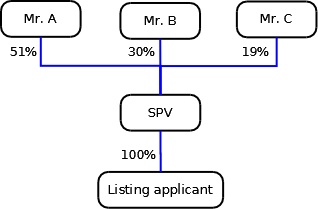 In Example 3, the SPV held by Mr. A, Mr. B, and Mr. C is considered to be the controlling shareholder as it can exercise 100% of the voting power at general meetings of the listing applicant. In this scenario, the HKEx considers Mr. A to be a controlling shareholder as Mr. A controls the SPV by holding more than 50% of the voting interests of the SPV, and in turn, the SPV's voting interests in the listing applicant. Conversely, Mr. B and Mr. C are not regarded as a controlling shareholder as each holds less than 50% of the SPV's voting interests and they are not in a position to control the SPV's voting interests in the listing applicant. However, the HKEx will presume Mr. A, Mr. B, and Mr. C to be a group of controlling shareholders of the listing applicant on the basis that they have agreed to restrict their ability to exercise direct control over the listing applicant by holding their interests through a common investment holding company, the SPV. If Mr. B and/or Mr. C do not consider themselves to be part of the group of controlling shareholders, the listing applicant should provide a detailed submission to rebut this presumption. Mr. B and Mr. C will be considered to be controlling shareholders unless the HKEx accepts such rebuttal. The factors that HKEx will consider when determining whether any individual shareholder has been acting as part of a group of controlling shareholders are set out in Listing Decisions HKEx-LD44-4 and HKEx-LD51-5. In Listing Decision LD44-4 (archive), it was found that special circumstances existed which justified aggregating the shareholding interests and control of a group of shareholders for a listing applicant's most recent audited financial year which enabled it to meet the Listing Rules ownership continuity and control requirement under Main Board Rule 8.05(1)(c). The listing applicant had two classes of shares. The Class A shares were held by ten individuals (the Founding Individuals) who held more than 51% of the voting rights but only around 10% of the beneficial interest in the company. The Class B shares were held by three financial investors (Financial Investors) who held approximately 90% of the company's beneficial interest but only 49% of the voting rights. A shareholders' agreement had been entered into between the Founding Individuals and the Financial Investors which gave the latter veto rights over major corporate decisions regarding the company's operations. whether any group of shareholders could be regarded as "acting in concert" for the purposes of the Takeovers Code. no single largest shareholder or single largest group of shareholders among the Founding Individuals ever attempted to exercise his/their voting rights independently without the agreement of the other Founding Individuals. On the same analysis, the HKEx found that the Financial Investors never acted as a controlling group that would enable their interests to be aggregated since each Financial Investor was an independent private equity investor owned and managed by different entities. Other than the investment in the listing applicant, they had no other joint investments. The Financial Investors did not have any understanding or arrangement that their board representatives would vote in a coordinated manner and the SFC did not regard them as concert parties in respect of the listing applicant under the Takeovers Code. While the Financial Investors had some operational control over the listing applicant by virtue of their veto rights under the shareholders' agreement, this was insufficient to establish ownership control since the Founding Individuals had responsibility for day-to-day management and the Financial Investors had never exercised their veto rights. Their veto rights did not affect the Founding Individuals' ownership continuity and control. the listing document disclosure requirement: details of any controlling shareholders and their interests in any competing business must be disclosed in the listing document under Main Board Rule 8.10 and paragraph 27A of Appendices 1A and 1E to the Main Board Rules (GEM Rule 11.04 and paragraph 27A in Appendix 1A). a controlling shareholder transfers voting interests to a trust for estate planning purposes and the controlling shareholder has retained control over such trust and the listing applicant consistent with the principles set out in Listing Decision HKEx-LD48-3. Listing applicants are required to apply the definition and interpretation of controlling shareholder as set out above and determine the identity of their controlling shareholders immediately upon completion of the offering and/or placing, and to disclose in their listing documents the information required by paragraph 27A of Appendix 1A to the Main Board Rules and the GEM Rules, Main Board Rule 8.10(1)(a) and GEM Rules 11.03 and 11.04 in relation to the controlling shareholder(s). restrictions on voting and disclosures in specific circumstances. dispose of shares in the period of 6 months commencing on the date on which the First Six-month Period expires, if immediately following such disposal that person or group of persons would cease to be a controlling shareholder (the Second Six-month Period). Any offer for sale of shares referred to in the listing document is not subject to the above restriction. The rationale behind the lock-up requirements is to give investors comfort that the controlling shareholder has no plans to sell down its shareholding in the near future and that its general intentions with respect to the issuer are unlikely to change in the period immediately after listing. where a controlling shareholder's interest as at the date of the listing document will drop to below 30% due to an event which is certain to happen based on the information disclosed in the listing document (e.g. because of the issue of new shares by the listing applicant and/or the sale of shares by an existing shareholder as part of the offering or placing), the controlling shareholder will be subject to lock-up during the First Six-month Period, but not during the Second Six-month Period. This is because the shareholder would have ceased to be a controlling shareholder during the Second Six-month Period. where the controlling shareholder's interest will fall below 30% as a result of the exercise of an over-allotment option by the underwriter(s) of an offering and/or placing, such shareholder will be subject to a 12-month lock-up of its shares after listing. It must therefore hold at least the same number of shares for at least 12 months after the listing. The rationale for this is that it is uncertain at the time of listing whether or not the over-allotment option will be exercised. Given that the controlling shareholder is willing to remain as the controlling shareholder if the over-allotment option is not exercised, investors should be entitled to expect that it will remain as the controlling shareholder if the over-allotment option is exercised.5 This is consistent with the HKEx's decision in listing decision HKEx-LD85-2015 (archive) where the HKEx determined that a listing applicant's controlling shareholder was subject to a 12-month lock-up of its shares following the listing notwithstanding that it ceased to be a controlling shareholder when its shareholding dropped below 30% on exercise of the over-allotment option by the global coordinator of the listing applicant's IPO. in the Second Six-month Period: (i) the shareholders constituting the group of controlling shareholders must not change; (ii) there must be no material changes in the voting interests in the listed issuer of each shareholder constituting the group of controlling shareholders (or by each shareholder of the SPV as the case may be); and (iii) such group of controlling shareholders (or SPV as the case may be) must maintain the aggregate voting interests of at least 30% in the listed issuer. The HKEx will assess whether any change in the voting interests held by each shareholder constituting the group of controlling shareholders amounts to a material change on a case-by-case basis. The HKEx encourages prior consultation with them regarding any plan to transfer voting interests in the listed issuer (or SPV as the case may be). connected transaction implications: acquisition of an interest in a target company from a third party is a connected transaction if the target company's substantial shareholder is or is proposed to be a controlling shareholder of the listed issuer15. In light of the publication of HKEx-GL89-16, HKEx Rejection letter (HKEX-RL-05-05) regarding a failure to satisfy the "ownership continuity and control" requirement was updated. The HKEx's revision clarifies that it expects listing applicants to illustrate "ownership continuity and control" as required by Frequently Asked Questions (Series 1 No. 16) for at least the most recent financial year up until the time immediately before the offering and/or placing becomes unconditional.